At Hudson Woods, we have three zones. Each time the temperature is changed, Nest records the data and learns preferences and habits. It takes only a few days for thermostats to start operating on their own, allowing for up to 20% reductions in energy costs. The Auto-Away option turns to an energy-efficient temperature when no one is home and if anyone forgets to turn down the thermostat when they leave. Nest is also accessible through a mobile app or online where we can control temperature settings. Adjustments can be made for pets or visitors remotely while making sure the home is at a preferred temperature when we return. A leaf also appears on the dial when we do something that saves energy. Leaves are collected each month to track energy efficiency. In December we earned 17 leaves compared to 25 in January. Last month we earned 28 leaves, placing us in the top 30% of “Nesters” in our area. 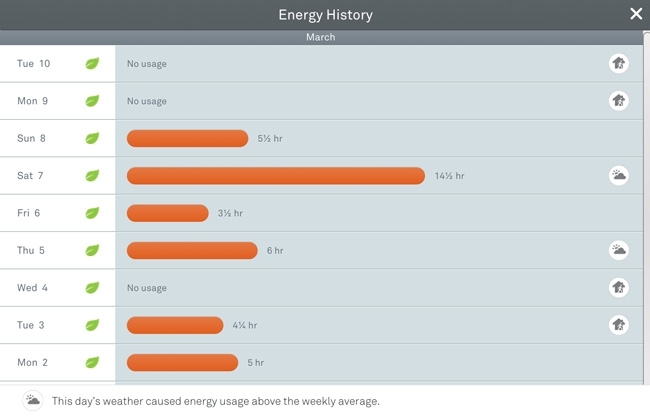 Despite colder temperatures in January & February, Nest was able to improve energy efficiency. Additional reports can be accessed remotely through the Nest app or online. The reports provide energy use history by day and month with notes on why usage changes may have occurred. 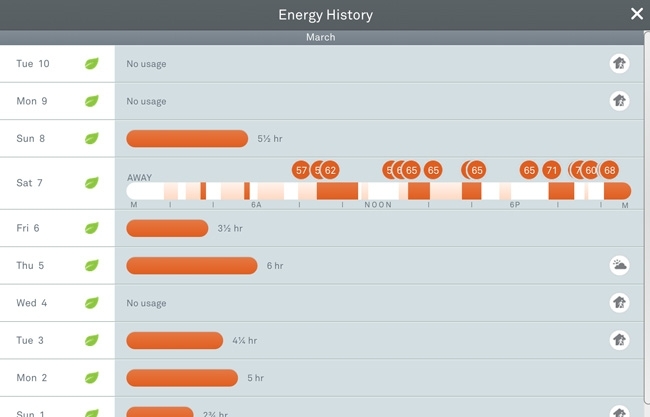 Nest also provides tips on improving energy use and earning more leaves. For instance; turn the temperature down at night when staying warm under a blanket and after a few days the thermostat will do it automatically. It will turn the temperature back up again in the morning. Along with the Nest Thermostat each Hudson Woods home is built with the Nest smoke detector and carbon monoxide alarm.